In the ongoing debate about prequels, I have said that publication order is almost always preferable to narrative chronological order. Prequels are usually bad starting points, but there are exceptions, and the Elric saga is one of them. In this case you should definitely not follow the publication order. Here are my reasons. That’s a mess. I can understand why a literary analyst or a die-hard fan might want to follow this order to get the full effect of Moorcock’s evolution as a writer. The ’60s books are nihilistic products of an angry man in his 20s involved in bad love affairs. The ’70s stories are more polished and their cynicism less raw. The latter-day Moorcock of books 2 and 6 show a sophistication rarely seen in the pulp-fantasy genre. Publication order would admittedly minimize the schizophrenic feel of this, but strangely enough, the schizophrenic feel is much the series’ point. Depending on situation, Elric is more control of himself or in thrall to the homicidal urges of his sword. He takes drugs too, and in a way the saga feels like it’s on drugs. It reads naturally when it’s all over the map like this in tone, but not with a butchered chronology. 2. The Problem of The White Wolf. If I had started with Weird of the White Wolf, I would have gone no further. Not because of the stark nihilism (that part is great), but because the stories are so woefully underdeveloped. Elric’s momentous return and destruction of his city reads like a footnote, glossed over in 60 pages, and the characters of Yyrkoon and Cymoril are mere ciphers. Cymoril wakes from her enchanted sleep and is immediately impaled on Elric’s sword. She and Yyrkoon speak — literally, I kid you not — a single line of dialogue each before dying. 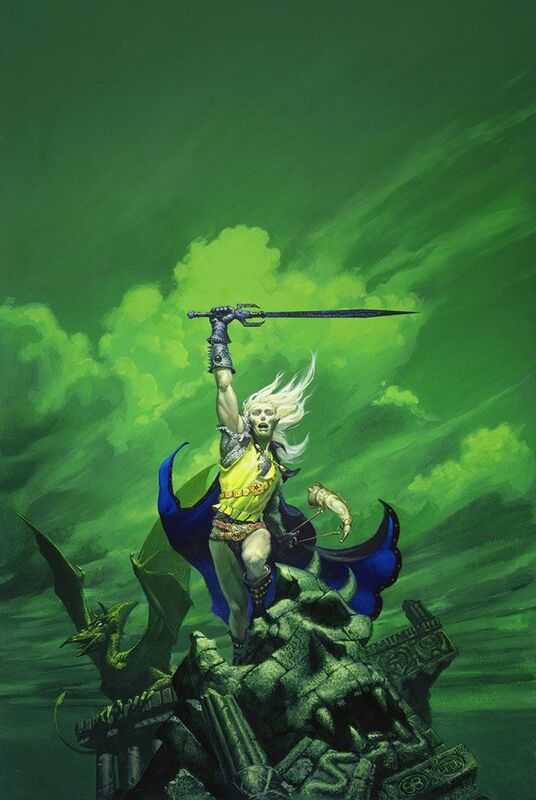 Elric of Melnibone, on the other hand, is a perfect entry. It doesn’t read like a prequel at all; the characters are lively depicted and the world takes you right in. I realize why fans cherish Weird of the White Wolf: in 1961 the stories offered an unprecedented vision of a tragic anti-hero, a demonic sword that is a character as much as Elric, and classic scenes like the dragon attack on the fleeing ships. As magazine short-stories they were surely impressive. But Moorcock should have fleshed them out later, when repacking his saga in novel format. Read in chronological sequence, Weird of the White Wolf is underwhelming. Read first, it could kill your interest in the saga altogether. 3. The Final Act. You have to end with Stormbringer. Its devastating bleakness remains unrivaled, and the more you read about Elric beforehand the greater the payoff. Hell comes to earth and warps everything — the land, seas, air, and all lifeforms including people who turn so hideous they kill themselves — that Elric has no choice but to destroy the world, and himself. It’s the novel to end all novels (certainly one of the best fantasy novels of all time), and any prequel after this would seem trivial. Or put it this way: if you actually read Stormbringer third in the series, you will need to get a huge distance before continuing with any of the five “prequels”. It’s just too dramatically traumatizing to fall anywhere but last. The Elric Saga is an exception to the rule of publication order. Follow this chronological order. It pays dividends. Loren, have you read, and,if so, what are your thoughts on the later Elric novels, The Dreamthief’s Daughter, The White Wolf’s Son, and the Skraeyling Tree? No, I haven’t read anything beyond the eight series-novels, though at some point I’ll probably try them. Are books 2 and 6 optional, in your opinion? I read the 5-volume series back in the early 80s. Pearl and Rose much later. Yes, they are optional; the remaining five are an epic set. But with that said, reading them integrated into the series may well improve the epic nature of the story. No, I would insist on them as part of the canon, especially since I think they are very good. This is how I’d rank the series. 2 and 6 are in the top half. This is awesome! I’m going through it again and had originally read Fortress and Revenge of the Rose out of order when they were originally printed. Thanks for this, otherwise I would have read them out of order. Actually, I already mistakenly skipped “The Fortress of the Pearl” because the “Elric Saga Part 1” was published before 1989 and had thus gone straight from Book 1 to Books 3 and 4. Anyway, it’s “not too late” to correct it thanks to this info. I was reading this epic saga chronolically (though I missed out Fortress Of The Pearl & Revenge Of The Rose), and to my surprise I choked up a tear reading Stormbringer when Elric revisits his old room for the last time. Very, VERY few times will a book have an emotional impact on me.